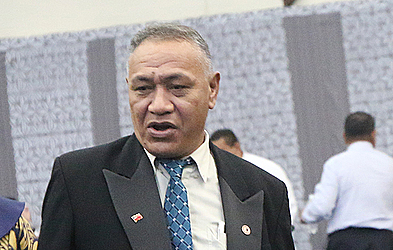 Member of Parliament, Olo Fiti Vaai has called on the Ministry of Revenue to conduct a thorough assessment of the revenues collected from duty charged at the wharf. “I am certain that some businesses are not paying the right duty taxes. If not that then someone is pocketing the duty taxes,” he said. He also questioned the accuracy in figures that is submitted by the Ministry of Revenue for each financial year and zoomed in on fiscal years 2017-2018 with 2018-2019. “Look at the imported duties taxes the 17-18 financial year estimates $56 million it is almost the same amount for the duty taxes for the 2018-2019 financial year. “The question is why, yet we see that the businesses community placing orders and you see containers coming in all the time. It is a clear indication the businesses are profiting yet the figures provided are the same for the last financial year and the current,” he said. Annual revenues and taxes collected for 2017-2018 amounts to $517,610,098. According to the financial reports for FY 2017-2018, the income tax is $69 million; Income tax Sole Trader $1.5million; Income Tax Sole Trader Provisional Tax; Import duties $56 million; V.A.G.S.T. Imports $145 million and Import Excise Taxes $71 million and Domestic Excises $56 million. “The Government proposes that same revenue collection from last financial year and it is not right. Who knows maybe there are no more imported goods, or maybe the containers get into our waters and the businesses will go and haul in their containers without paying taxes, it sounds funny, but the reality is that it is not the case, either the companies are not paying or the duty taxes are being pocketed,” he added. Attempts to get comments from the Minister of Revenue, Tialavea Tinision Hunt have been unsuccessful.